LEXINGTON, Ky. (Tuesday, December 16, 2014) – Voting is now underway via the National Thoroughbred Racing Association (NTRA) website, www.ntra.com, for the 16th annual NTRA Moment of the Year. Fans can choose from among 10 of the year’s most memorable, moving and significant events in Thoroughbred racing. The winning moment will be revealed the morning of January 16 at the annual ThoroFan Awards Breakfast at Gulfstream Park Racing & Casino in Hallandale Beach, Fla., and recognized at the following evening’s 44th Annual Eclipse Awards, also at Gulfstream Park. Those that vote for the eventual winner automatically will be entered in a random drawing to win a $100 gift certificate for Breeders’ Cup merchandise. 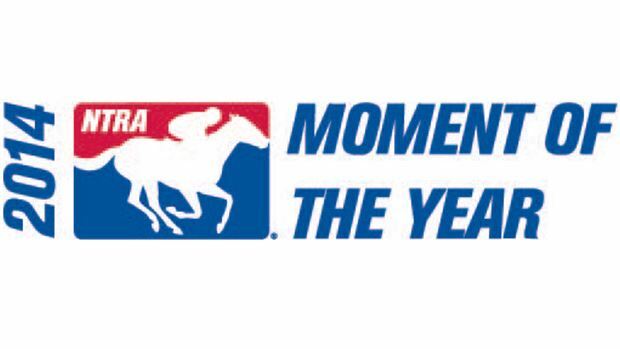 To vote for the “NTRA Moment of the Year,” visit ntra.formstack.com/forms/ntra_moment_of_the_year. The first-ever “NTRA Moment of the Year” was the touching scene between Charismatic and jockey Chris Antley following the 1999 Belmont Stakes. The next year’s winner was the stretch run of the 2000 Breeders’ Cup Classic, which saw Tiznow hold on for a dramatic victory against Giant’s Causeway. Tiznow won again the following year as fans selected his stirring repeat victory in the Classic over Sakhee. In 2002, fans cited the passing of the last living Triple Crown winner, Seattle Slew. In 2003, the popular Kentucky Derby win by Funny Cide was selected. Birdstone’s upset win in the Belmont Stakes over Smarty Jones took down top honors for 2004. In 2005, fans selected Afleet Alex’s spectacular victory in the 2005 Preakness Stakes. Voters in 2006 chose Barbaro’s gallant struggle to recover from his Preakness injury while at the New Bolton Center. The 2007 Moment of the Year was a historic victory by filly Rags to Riches over Curlin in the Belmont Stakes. In 2008, it was Zenyatta’s win in the Breeders’ Cup Ladies’ Classic. Zenyatta “repeated” in 2009 as fans selected her triumph in the Breeders’ Cup Classic. In 2010, fans selected Blame’s narrow Breeders’ Cup Classic victory over Zenyatta. Drosselmeyer’s hard-fought win over Game on Dude in the Breeders’ Cup Classic was the public’s choice for 2011. For 2012, the recovery of Paynter from near-deadly battles with laminitis and colitis captured the hearts of voters like no other story. Last year, fans recognized Mucho Macho Man’s nose victory in the $5 million Breeders’ Cup Classic for his popular connections. Fans 18 years and older can register to vote online at www.ntra.com. There is a limit of one vote per valid e-mail address. Multiple votes from the same e-mail address will be disqualified. Votes must be received by 11:59 p.m. (ET) on Friday, January 2, 2014. To vote for the NTRA Moment of the Year, click here.